Most of my books have some sort of story about how they came to be. BE KIND was inspired by the time I spilled grape juice in my then-boyfriend, now-husband’s car. WIDE-AWAKE BEAR was inspired by an epic meltdown my youngest daughter had. WHEREVER YOU GO was inspired by all the feelings I had when my oldest daughter graduated from high school. My latest book, LORETTA’S GIFT, doesn’t have as media-friendly of a backstory. I wrote it while I was trying to write like someone else. Generally, this is not a writing strategy I recommend. Most people tend to write best when they sound like … themselves. Still, there’s something to be said for finding a writer you like and seeing what you can learn from him or her and applying it to your own writing style. And, that’s what I was doing. There’s an author I admire who has a very clean, almost spare, writing style with tons of heart. So I sat down at my computer with no real story in mind and thought. “What if I tried to write like that?” I picked the name Loretta, because I had a great-aunt with that name, and got started. Well, the end result is, after much revision, I got a book out of the experience. Which is not necessarily something I would have predicted. It’s illustrated by Alea Marley and published by little bee books. And it was released TODAY. Leave a comment on this post. I’ll pick one random winner. Share a link to this blog post on Twitter with the hashtag #LorettasGift. I’ll pick another random winner. But back to the topic at hand. If there’s an author you admire that you’d like to write like, here’s the process I’d recommend. Decide WHAT you like about this author. If you like an author, chances are he or she does many things well. Don’t try to replicate them all. Pick the thing you’re most impressed with. The one thing that might most benefit your writing. Is it a memorable voice? A complete absence of adjectives? The pace of the story? A certain structure? Snarky humor? Then, write like you while trying to incorporate this one thing. Study HOW the author does it. Read several books by this person focusing solely on how they do that one thing you like. What techniques do they use? Why does it work? Do they ever consciously choose to do something different for effect? The thing about writing a draft and trying on a new style is that no one will know if you mess it up. So give yourself permission to go wild. If your goal is a memorable voice, let it rip. Go over the top. If your goal is the tightest, leanest story possible, cut words like you’re getting paid for every one you slash. Ask: “What would my favorite author do?” And do it even more. I suggest this approach because you always can scale back in your revising if you’ve gone too far, but chances are being ruthless will get you closer to where you want to be. The author you admire is the author you admire. You are you. Your final product is not going to look like your admired author wrote it. And that’s a good thing. I don’t think anyone would pick up LORETTA’S GIFT and know which author I was trying to emulate. (In fact, if you guess correctly, I’ll send you a free copy.) But I think my attempts to be more like this other person led me to a better story. Alea Marley, book giveaway, Pat Zietlow Miller, picture books. Bookmark. Great advice. Can’t wait to read your latest! What a fun book and Interesting backstory with the inspiration on writing it. Thanks for the writing tip on stretching our own writing! Pat, your books always have tons of heart! Congratulations on Loretta’s Gift!!! I’m going to try your advice…I am always guilty of finding several things about an author and trying to emulate them:). thanks for your gift of insight! This sounds like such a sweet book. I can’t wait to read it. Thanks for sharing your story. Thanks for the advice & inspiration. Beautiful book! So excited to read your newest book. Thanks for great suggestions about learning from a favorite author yet keeping your writing your own. Thanks for reminding us to be word ruthless. Less is more. What treasure of stories, thank you for sharing them. This is the perfect blog post to share with my students as we work on our author study unit. Examining an author’s technique and craft and then trying to write that way is probably much more difficult than it appears. But I love your advice about giving yourself some slack! Thanks for your insight! I’m going to use “Be Kind” in my middle school classroom and I’d love to add “Loretta’s Gift” to my classroom collection as well! Imitation is an interesting concept. I might just give it a try. Cutting words and going spare is never a bad idea –even if I can’t write as simply as Suzanne Bloom. This is such great advice! I will definitely be sharing this blog with my middle school students as we work on our author studies unit. I love your suggestion to examine the author’s craft and technique to figure out what you like best about the writing, and then just go for it! Thanks for sharing! 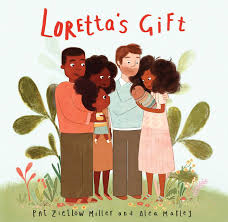 I plan to use “Be Kind” to start the school year, and look forward to adding “Loretta’s Gift” to my classroom collection! Congratulations Pat! Looks like you’ve got another winner. Hope it finds much success. You’re books are always so lovely and have so much heart. I can’t wait to read this book to my girls! Welcome to the world LORETTA’S GIFT! Congratulations Pat on another beautiful book for lucky readers’ shelves and hearts. Happy book birthday! This looks very sweet! Congrats, Pat and Elea! I predict that Loretta might be the next hot baby name. 🙂 Love this idea of emulating a master…illustrators are taught to do this and it seems it works for writers, too. Happy to see this one coming (my mailing confirmation just popped into the inbox, but I’d still love to win the giveaway.) I love hearing about the writing exercise you tried to get this one started and eventually published. Happy Book Birthday! Congratulations Pat and Alea! Can’t wait to read this one! I love the idea of studying an author I admire and incorporating something from he or she’s work that will benefit my own writing! I’m looking forward to this one and I love a good guessing game! Is it Julie Fogliano with the “very clean, almost spare, writing style with tons of heart.” ? I adore Julie Fogliano, and she’s a great one to emulate, but this book was not inspired by her. Thanks for guessing, though! Great suggestions, Pat. I was just fan-girling on Laurie Keller this morning 🙂 Congrats on LORETTA’S GIFT and thanks for sharing the story behind the story. Love the concept! Love that it’s multi-cultural! Thanks for the great advice. I plan on using it when studying picture books as I try to write my own. An interesting writing “prompt” that I look forward to trying. Happy Book Birthday! Thanks for this suggestion. I am enrolled in a writing course and one of our writing assignments was to look at an image (provided by the instructor) and write a few beginning lines for a hypothetical picture book, but using a style similar to the opening of one of our favorite already-published books. It was fun and I think I might have a new manuscript to work on as a result! Thanks for these useful tips for expanding and experimenting with writing style. I’m looking forward to seeing this book and to a possible reveal of the admired writer. Congrats on another lovely book, Pat! So interesting to hear the backstory! Pat – frankly, I would love to write more like you! But I know just what you mean. In fact, I am currently studying PB biographies by a particular author to try to learn her lean but emotive style. So thanks for sharing your journey and reinforcing mine! Thank you, Pat for a great post! I can’t wait to read Loretta’s Gift! I love your books, Pat, and can’t wait to read this one. I admire how much heart goes into each of your titles and wish I could capture that technique of yours. Now, I’m really curious about the voice in your new story. I consider some of your books as my mentor texts. This book looks amazing! I can’t wait for it to join our school library collection. I pre-ordered this book, so it came today! However, I’d love to win one that my grade 2ers can pour over and enjoy. They love getting to hold the same book as I use it for a read aloud. Thanks, Pat, for the interesting and informative post! Thanks for the great post Pat. And congrats on LORETTA’S GIFT! I love how you broke down the process of looking at a respected author and studying their work. I made such good sense! That’s really good advice. I am an illustrator and have used this method with my illustrations and it often works out well for me. Usually the end result is quite different from the illustrator I was trying to emulate – which is great – its just a good way to get started. I hadn’t thought of doing this with writing but I think it’s a great way to get me going with my first book! Congrats, Pat! Can’t wait to read and share. Such fantastic advice! Thank you. I love all the stories behind the stories including this. Congratulations!!! Happy Book Birthday! Great post! 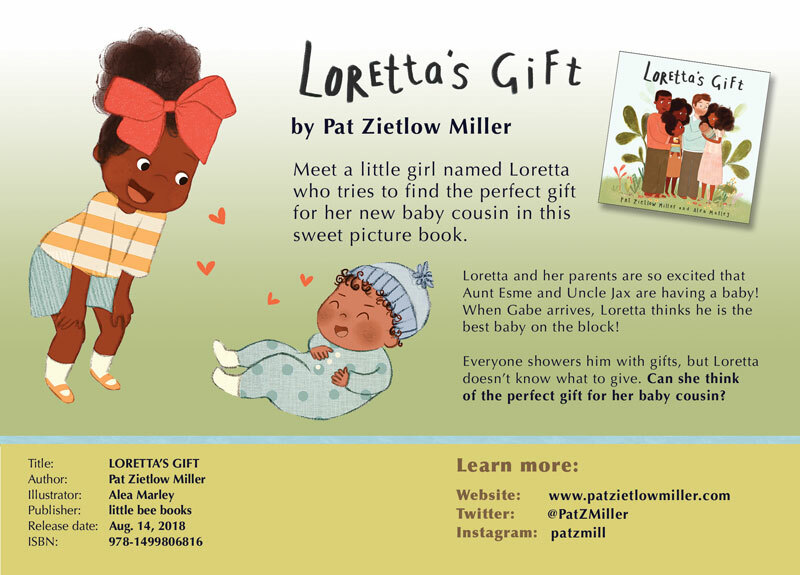 I loved learning how Loretta’s Gift came to be! I can’t wait to read it! I really enjoy your writing style. I’m curious…. is Peter H. Reynolds the author you emulate?? I love his books! Lori — You are correct. I’d just finished re-reading ISH and DOT so I decided to see what I could do. And, as I said, I didn’t hit all my goals, but I did get a good story. I’ll send you an email and you can send me your address and I’ll mail you a copy! Thank you for the free book! I look forward to reading LORETTA’S GIFT. I love your BE KIND, WIDE AWAKE BEAR, and WHEREVER YOU GO books. Have you read SKY COLOR also by Peter H. Reynolds? I love the advice you shared. I also am in love with the concept of this book. It looks truly beautiful. Congratulations on your new book. I’m looking forward to reading it. Great advice and a beautiful book! I especially like your tip about picking ONE thing that impresses me most about an author’s writing. That will help my focus. Thanks, Pat!! I love your suggestions. I already have a writer in mind – let’s see what I can do! Congratulations on your latest release! If it’s written by you, it’s sure to be good. And thanks for the wonderful advice! Great idea, to choose just your favorite aspect of another author’s writing and try to incorporate it into your own. You may even discover you like your own version even better! 😊 Thanks so much, Pat! Love all your work Pat, can’t wait to read your latest. Thanks for sharing your advice! Just added Be Kind to our new book shelf and it is circulating well and patrons are placing holds. Can’t wait to see your new title! The part about going over the top and no one will know, might cure the perfectionist in me. “Be Kind” is needed by all readers, not just children. Congratulations on the NY Times best seller positions. Excellent advice, and another lovely book. Congratulations, Pat! I love Be Kind and have gifted it to all of my nieces and nephews. I can’t wait to check out your new book! Congratulations! Love the post about how to gain writing skills by studying and writing in the style of admired writers. Perfect! Great post Pat! Your book looks beautiful! It looks like another lovely book! Thanks for the insight to this one! I think any inspiration that results in a wonderful book is a great inspiration. Love your books! This has me thinking about what is that one thing about several of my favorite books. Not an easy task but a good exercise. Thanks! I’m in love with the illustrations! Definitely enter me into this cute giveaway. Pat Zietlow Miller, I love your books so much!!! Thanks for bringing so much beauty into the world! Loretta’s Gift looks wonderful. Thanks for sharing your insights. I’m going back to reread books by my favorite authors – including you! Congratulations on what looks like another great book, Pat. Adding it to my library request list.